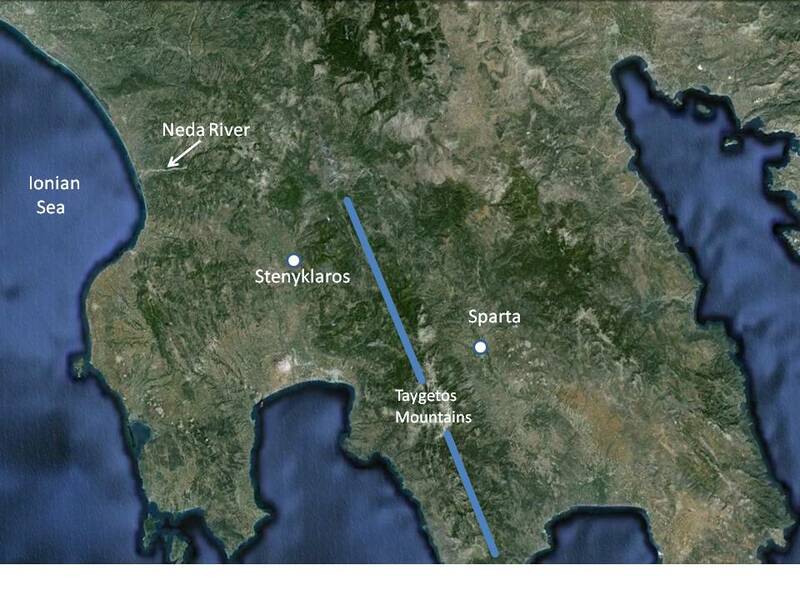 Following the annexation of Aigytis, Sparta maintained contact with the remnants of the Aipytid Kingdom located at Stenykharos northwest of Sparta on the west side of the Taygetos Mountains. But after the Spartans annexed the Taygetan Minyai (a surviving clan of the Mycenaean Age located on the Laconian side of the Taygetos), they were emboldened to move for control of the west side of the mountain range. The First Messenian War (740-720 B.C.) was the outcome of that desire. After Stenykharos surrendered, its plain became new Helot territory. The full extent of this conquest was not known, but it appears that most of the land west of the Taygetos to the Ionian Sea and north to the Neda River was taken. Tyrtaios, the Attic poet, sent to Sparta by the Oracle to assist with the Second Messenian War, stated that the first war was fought by the grandfathers of the men who fought in the second war. That would put the timeframe of the second war at about 690 B.C. Technically his words were “the fathers of our fathers”, which could have been an imprecise use of the term, so the second war may have taken place in the middle of the seventh century. The second war was not one of conquest but the putting down of a revolt. Toynbee suggests that it was the time of establishment of the Lycurgian reforms, not earlier as others have suggested. His reasoning was that the Spartan commoners would have demanded rights in return for their help in protecting the new kingdom. Let’s look at this is a little more detail. 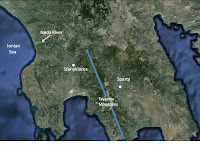 Many of the ancients, including Thucydides connect Lycurgus with the militaristic Spartan system we’re all familiar with and set his date farther back than it should be. In reality we don’t know when Lycurgus lived or whether he even existed. It has been written that the Lycurgian reforms were put into place to overcome the domestic instability in Sparta existing before that time. What was the cause of this instability and when did it occur? A logical explanation derives from the rapid conquests preceding the Second Messenian War. In the period from 760-720 B.C. Sparta conquered Amyklai, Aigiai, Gythion, the lower Eurotos Basin, the Tagetan Minyai, and Stenyklaros – a vast amount of territory to try and control. The administrative challenges associated with these conquests must have been formidable. With the risk of revolt great and the administrative challenge daunting, the ruling class must have realized the importance of a citizen-based military (hoplite phalanx), and they may have been pushed in this direction by the commons who wouldn’t serve without receiving a property allocation. One piece of evidence to support this is found in Aristotle’s Politics. The Spartan leadership was certainly in a position to allocate land because of the enormous size of the conquered lands. So the devil’s bargain was made – land to the commons in exchange for their willingness to fight in phalanx formation. It seems that the new structure would have been instituted in a single step because of its interdependency. The need for a new kind of army generated a new constitution and social system. Of course a constitution can be created as a single event while changes in a social system take time and generations to take hold. Even the governmental changes must have occurred over time. For example, the Ephors had to transition from advisors to the king to being elected by a citizen assembly which did not exist before the reforms.